( microphone stands will also fit into the bag.). The pockets are approx 13 in circumference. We usually beat our competition! Condition: This is a "new other" item. Item has not been used or installed. Item is mint and complete. Product was never used or installed. FIND A LOWER PRICE?. Flash & Lighting. Computers & Accesories. Binoculars & Spotting Scopes. Batteries & Power. Bags & Cases. Albums & Storage. Original manufacturer software once opened. Single Arm 3-section with bracket. This is a NEW. Manfrotto 396AB-3 dreiteiliger Gelenkarm mit Doppelrohr. Die Halterung ist offen, da die Rollen ja unterschiedlich lang sein können. Ein Griff zum Tragen oder anhängen (zB. am Stativ) ist optimal bei unterschiedlichen Einsatzorten. Manfrotto Avenger LGH330N Gel Holder 330mm - Farbfolienhalter. We are an Authorized Canon and Nikon Dealer listed on Canon/Nikon USA's website. Tether Tools Rock Solid Articulating Arm 11" TheTether Tools Rock Solid Articulating Arm 11" is a versatile arm that features a 1/4" screw on either end and a hot shoe adapter. This arm can securely mount any of your accessories compatible with 1/4" screws, such as viewfinders, mics, monitors and lights. 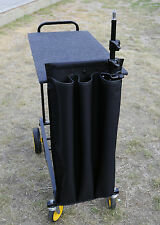 What's Included: TWO Light Stands and TWO Umbrellas. Although we strive to discover and describe any issues or problems with an item, we can (and do) make mistakes. Weight: 8.2 lbs. Functionality: Tested and Working. See photos. 1001 Warehouse Location:___Warehouse #1_Shelf___8227_______________________________. In the event that any clauses or phrases contained here within are ruled out by a judge, the law, a lawyer, jurors, and or any other entity all others remain in effect. Manfrotto Clamp. Art. 035 Max Load 15Kg. If you have the new compact pantograph, the TOP 2 version has a red notched ring, while the TOP 4 version has a blue notched ring. Spring Type 4 Blue. For loads over 13Kg. Manfrotto 014-14 Rapid Adapter - 5/8" Stud to 1/4-20" Thread. Max load up can be up to 3.0kg. It can support standard 5/8" studio light stand. 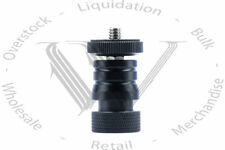 Kaavie Type B Flash Holder x 1. Manfrotto MB LBAG 90 Transport-Tasche für bis zu 3 Stück Babylight-Stative 1051BAC oder 1052BAC. Es passen genau 3 Babylight-Stative 1051BAC oder 1052BAC rein. Our C-Stand heavy duty wheel kit will fits on the bottom of standard C-Stand legs. Works with C-Stands with turtle base and sliding leg. Sturdy caster wheels include brakes for extra durability. An excellent lighting accessory for traveling photographers and film makers on the go! Ist ein Flexibler Schwanenhals - Haltearm mit hexagonalem Zapfen zur Befestigung an der SuperClamp von Manfrotto. Dieser hat an einem Ende ein 3/8" Innengewinde und am anderen einen 5/8" Zapfen mit 1/4" Außengewinde. Am anderen Ende des Halters befindet sich der Spigot Anschluss um den Halter samt Blitz mit einem Lampenstativ zu verbinden. Über die große Schraube wird der Halter am Stativ festgezogen. Spigot-Anschluss für Lampenstativ. Easy to Stabilize. A light head can be mounted to the base directly with the aid of a stand adapter. Sliding Leg for Uneven Terrain. Fold Away Legs with Sliding Leg. This stand features a leg that slides up and down the riser to accommodate uneven terrain or stairs. 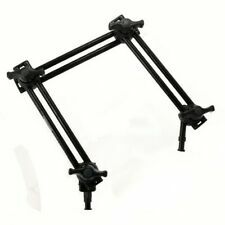 TheImpact 40" Extension Grip Arm (Black) is a staple of any film, video or photo production set. The 40" bar has a permanently attached 2.5" grip head with a large ergonomic T-handle. The Grip Arm is often used as a short boom. 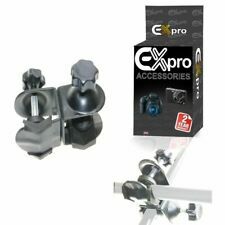 Description:This is a flash holder with ball head and a spring clampMini-head can rotate 360 degreesCan clamp on most light stands, tripods, pipes or board to mount photographic equipmentsThe strong c can be installed to flash holder, base, TTL cord and flash trigger with standard screw holeRubber caps on the clamp to protect equipmentThe strong c main body is made of metal, sturdy and durableMaximum Jaw Capacity: Approx. 55mm / 2.2 inchC Length: Approx. 105mm / 4.2 inchColor: BlackPackage Included:1 x flash c Brand Unbranded MPN Does not apply UPC 4894462163627 EAN 4894462163627 ISBN 4894462163627 Designer/Brand Unbranded UPC 4894462163627 EAN 4894462163627 ISBN 4894462163627. 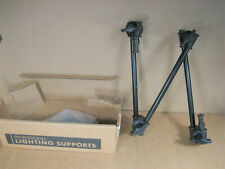 Manfrotto pivot clamp for boom stand. Condition is Used. Dispatched with Royal Mail 2nd Class. Condition: This is a "new other" item. Item has not been used or installed. Item is mint and complete. We usually beat our competition! FIND A LOWER PRICE?. Location: Bin 539. Baby Receiver Wall Plate with 5/8" Socket (9x15cm plate). This Baby Receiver Wall Plate with 5/8" Socket is designed for mounting baby fixtures to the top of set walls, studio floor, or an Apple Box. In good condition. No tears on cable. Has linhof cap on pole. pole separates into two pieces. See photos for details. The ProMaster LS-5 is a high quality photo video "C" light stand. Made of heavy duty steal, it is ideal for professional photographers and videographers. Because of the extra stable design, "C" stands are widely used to hold light booms, hold backdrop supports, reflector supports and much more. SET OF 2AVENGER D310 MINI FLEXTENSION. TheAvenger D310 Mini Flextension is a flexible arm that when bent, holds its position while adding 4.33" of length to articulating arms or gear of that nature. The arm has a 0.23" (6.0mm) stud at one end and a 0.23" (6.0mm) receiver at the other. 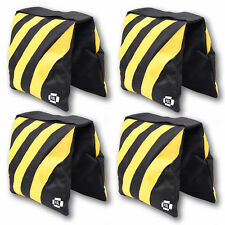 The legs are perfectly shaped for saddlebag-type sandbags. A light head can be mounted to the base directly with the aid of an optional stand adapter. The base allows individual legs to be set at any angle, and can be positioned in locations not possible with standard design stands. The arm features a distinctive design that allows any of the sections to be positioned anywhere along the length of the others and secured with large butterfly knobs. I bought this for a specific project and used it for a couple months. Manfrotto Avenger F1000 Pump Cup w/ Swivel - NICE!!! - Made in Italy!!! Used but still in very nice condition. Hopefully the pictures speak for themselves. Bid with confidence! Because of this, our warranty is, unlike most other suppliers, fully comprehensive with no strings attached, and we will continue to provide you with a full repair service once the goods are no longer covered by warranty and this service will continue once the goods have been discontinued too. When trying to get the perfect shot, you often have various lighting accessories such as flags, scrims and cutters set up around your subject. Corporate accounts and large quantity orders can be accommodated. Estate find, appear to be in excellent condition. See photos for more details on condition. Jaw width: 80mm. Jaw opening: 50 mm (maximum). Easy to Stabilize. The individual legs positioned at any angle in locations not possible with standard design stands. The included extension grip arm fits neatly into the stand's removable 2.5" grip head allowing you to offset the stand and cantilever flags, gobos or lights out of the way of the action. 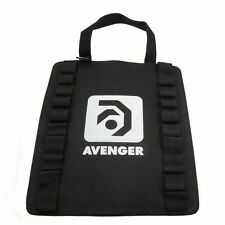 Avenger A2007CB Mini Turtle Base for C-Stand (Black). Model Number: A2007CB. 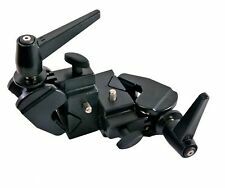 • Avenger A2007CB Mini Turtle Base for C-Stand (Black). ThisA2007CB Avenger Mini Turtle Base for C-Stand has a 1 1/8" receiver and is designed to accept Avenger column risers of various sizes. It looks like there are a couple of the photographic uses. One is as a agent to develope in high temperatures and the other is for anti swelling. Kodak cat. We are an Authorized Canon and Nikon Dealer listed on Canon/Nikon USA's website. Condition: Very Good. This is an Ideal clamp for many photographic applications. This replaces the Manfrotto 2915. (round tube): 2.17 in. ; clamp range - min (round tube): 0.51 in. ; color: black; load capacity: 33.07 lbs. 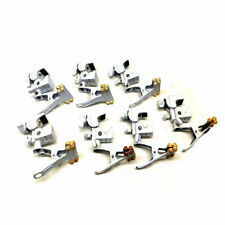 ; material: aluminum; weight: 0.90 lbs.